Given a Sorted Singly Linked List Array, Convert it into a Balanced Binary search Tree. Objective: You have been given a sorted singly List, you need to convert it into balanced binary search tree. You can also create first node as root and insert all other nodes to the right of the tree because List is in increasing order but this constructed tree won’t be balanced tree, it wil be skwed tree and to perform operations on this tree will be O(n) not O(logn). Say mid is the middle node in the linked list. Make the middle node as root and assign the left subtree to it. Recursively construct right subtree from mid+1 to end. Assign the right subtree to root. 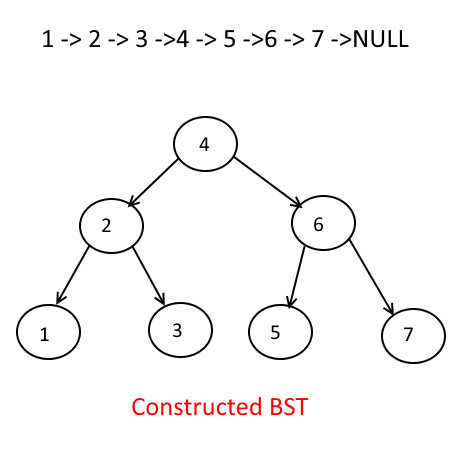 NOTE: This problem is very smililar to “ Given a Sorted Array, Convert it into its Balanced Binary search Tree” and “Convert a Sorted Doubly Linked List to Balanced BST” . Next story Reverse Alternate levels of a given Binary Tree. 225 queries in 0.121 seconds.